We inherit our genes from our parents, and their parents, and their parent’s parent’s and so on and so forth. So, before we go any further, we need to talk about why your beard isn’t going to necessarily look anything like your dad’s or your brother’s. And to do that, we have to delve a bit into the basics of genetics and heredity. Every person (with some exceptions) inherits half of their genetic material from their mom and the other half of their genetic material from their dad. Likewise, their parents got the same half-and-half gene inheritance from their parents. That means that you inherited 25% of your genes from each of your grandparents. Let’s stop here to make the next part simple. To make things even more complicated, we inherit a small amount of genes through our even more distant ancestors. For instance, you share about 0.78% of your DNA with your great-great-great-great-great grandfather (aka 5th great-grandfather). While unlikely, you may have gotten some of your beard-related recessive genes from him, a man likely contemporaneous with George Washington, because recessive genes easily skip generations. One of the most common recessive genes is red hair, for instance. It’s important to note that even as old as the science of genetics is, it’s still relatively new and there are always new discoveries being made. There are no bad beard genes. 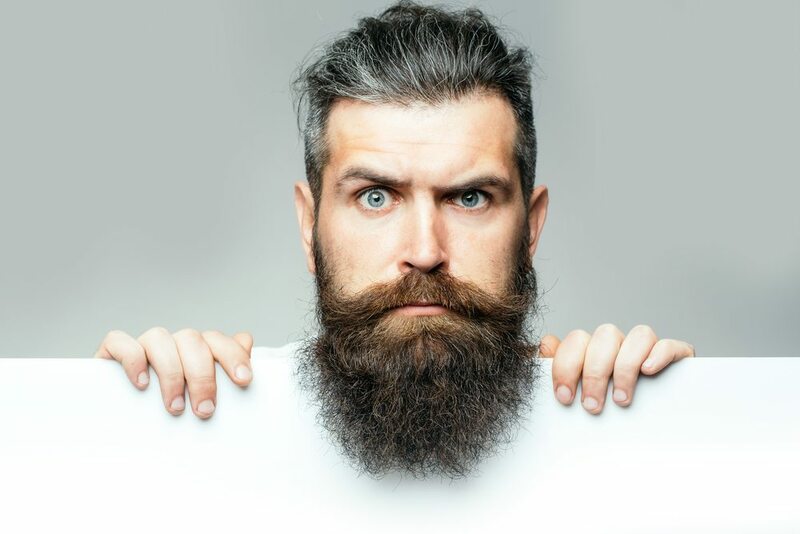 True, you may have inherited sparse or fine beard hair, but you can make it work by taking on the sparse beard hair-centric tips throughout this guide. What determines beard hair color? Beard hair color is determined by a few different things. For some men, their beard hair and head hair may be virtually identical. But many men find that this isn’t the case for them. Having a beard that’s a different color from the hair on your head is actually very normal. Menshealth.com breaks down the science behind it in this article. Simply put, different hair follicles can have eumelanin (divided into two varieties: black eumelanin and brown eumelanin, which are chemically different) and pheomelanin (red pigment). Obviously, large amounts of black eumelanin create black hair, and large amounts of brown eumelanin produces brown hair. Red hair has the most pheomelanin (up to 67%) and very little eumelanin. Auburn hair is made by pheomelanin and brown eumelanin both being present. Natural blonde hair comes from hair that only contains a little eumelanin and can veer towards strawberry blonde when pheomelanin is present. Guys with blonde or brown hair often have red or warm undertones in some of the strands of hair growing out of their scalps, so it’s very unsurprising when they end up with reddish beards. Famous bearded blonde Travis Fimmel in character as Viking leader Ragnar Lothbrok—note the color variation in his beard. And if your hair bleaches easily in the sun, chances are, your beard hair may bleach even easier and end up noticeably lighter than the hair on your head. Grey hair happens your hair stops producing pigment except for a small amount of black eumelanin. If you have gray in your hair, it could be age catching up with you. However, young guys will often find a few strands of silver. Gray hair in a beard can look distinguished, but it’s understandable if you’re a young guy who isn’t ready for that distinguished time of his life to want to avoid having a gray beard. Remember that stress isn’t just bad for beard growth; it has been linked to a change in your hair’s melanocytes which may indeed cause early graying. While you won’t turn gray overnight due to stress—that’s just a myth—you could see more gray in your hair than you would if you weren’t experiencing prolonged stress. Next article What Age Should You Start Shaving?